Direct Thermal Wristbands are printed from a small thermal printer which allows you to print directly on a patient's wristband, so there's no label to print and then apply to the wrist band, creating a one-step process. 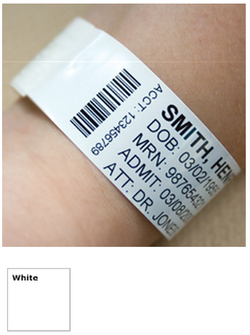 Within seconds, you can print and apply the wristband on a patient. Furthermore, the small space saving printer is easy to install and operate and requires no ribbons to install and no worries to destroy ribbons that contain important patient information.